Digital marketing. One of the newfangled buzzwords that business owners are using to sound smart these days. Or is there really something to it? With companies going the digital route and focusing on creating a strong online presence, we understand why you might also be thinking of joining the party. Do you want to start promoting your business online? Not sure what digital marketing means? If that’s the case, cheer up! In this guide, you’re going to find all the digital marketing basics you need to know about creating successful online marketing campaigns for your business. In simplest terms, digital marketing means marketing your products and services using the internet and digital media as the medium. This guide will equip you with all the digital marketing basics knowledge you’ll ever need to create a successful online marketing plan for your business. Alright, so make yourself a cup of coffee and let’s begin! If you are hesitating to invest in digital marketing, here are a few points to convince you of the significance of having an online marketing plan for your business. Cast a wider net: Digital marketing allows you to catch the attention of your prospective customers through a variety of ways. For example, Search Engine Optimization (SEO), which we are going to discuss later in this guide, helps you attract customers in an organic (unpaid) way. On the other hand, Pay Per Click (PPC) marketing uses paid ads to draw the audience in. By using different approaches you can reach a wider audience which can have a major impact on your brand recognition. Track your performance easily: Thanks to the easily available analytics tools online, you can track how your marketing campaigns are performing in real time. And it’s so unlike the traditional forms of marketing, where you had to wait for weeks to determine what’s working and what’s not! With digital marketing, you can observe which aspects of your marketing strategy need tweaking, and make changes accordingly. This gives you enormous control over your marketing campaigns and your budget. Target your audience effectively: Can you imagine targeting an audience based on gender, language, and location through traditional means of marketing? That’s one of the things we love about digital marketing; you can choose who visits your website and who sees your ads. The targeting tools and parameters available today are incredible in helping you target the audience you want. They are easy to use even if you only have a little knowledge of digital marketing basics. If you’re still curious, you can learn more about the importance of digital marketing for your business here. Now that you know why you need to know the digital marketing basics, let’s see what makes for an effective digital strategy. What are the digital marketing basics of a successful strategy? Engaging with each (or any!) component in the right way WILL grow your brand’s presence online in a powerful way. Understand this: your website is the face of your business. Its structure, color, design, and even writing (content) impact the way your audience perceives your brand. That’s why we always stress that your site should reflect your brand style and personality in addition to the general theme of your business. Consider your website an important extension of your business. Invest in a responsive website: It goes without saying that your website should look beautiful and organized. Also, your site should have a responsive design with an updated CMS (content management system) – don’t worry; your web developer will know what that means. The key is to have the right mix of design and functionality. An incredibly pretty website that takes over 10 seconds to load is not a sign of a great website – neither is a website that looks so cheap and haphazardly put-together that visitor starts to question your brand credibility. According to research, 48% of online visitors decide the credibility of a business on the basis of its site design, and 94% people reject a site on the sole basis of its design. Just look at the site design of Arngren.net. It’s a mess. Let’s just take a moment here. We can’t decide which is more catastrophic – the design or the layout. How much success do you think they have in catching the attention of their target customers? Everything is so cluttered, you can hardly comprehend what the website is about! Optimize your website: We are talking about Search Engine Optimization (SEO) here. We will go over it in more detail later in this post, but the key point from digital marketing basics you need to understand is SEO helps your business appear in the search engine results. From your website’s design to the keywords you choose, SEO covers everything. Create an easy-to-navigate website structure: A website should be structured in a way that the inbound users can explore easily. Every web page should be tagged and labeled so the users can find what they need. Monitor your website regularly: If you think website design is a one-time process, think again. With search engines changing their algorithms frequently and design trends upgrading constantly, you need to keep your website up-to-date in order for it to keep functioning great. You can read more about the characteristics of a good website design here. So you have created a masterpiece of a website. You have made sure it is optimized for mobile phone users as well. You paid special attention to the responsiveness of the design if you do say so yourself. Now all that’s left is for your target audience to find you. That’s what search engine optimization does. According to Hubspot, 81% of shoppers conduct online research before making big purchases. Let’s see what optimizing your website means. Search engine optimization is the process of improving the visibility of a website on organic (unpaid) search engine result pages (SERPs). SEO makes sure that your website appears within the top results whenever someone enters your targeted keyword(s) in the search bar. 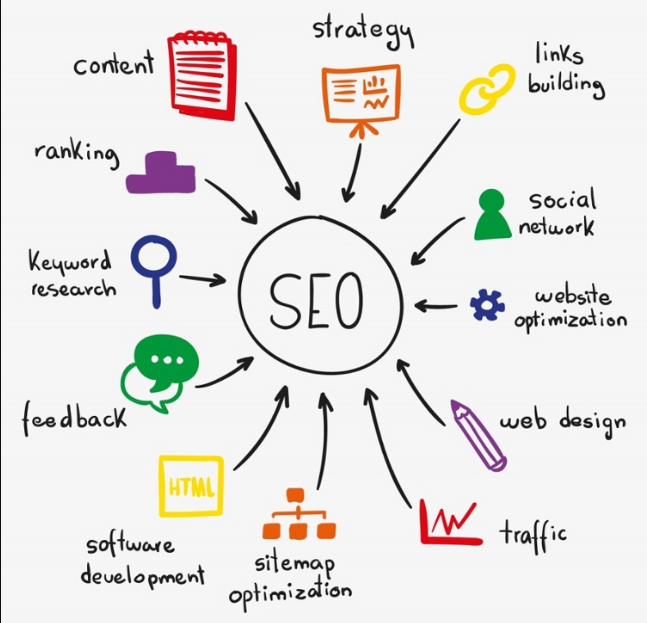 This image perfectly illustrates the major elements of a successful SEO strategy. Find the right keywords: Research your industry and find the keywords that identify your business. The keywords you target determine how Google (and other search engines) rank your website and how much traffic you bring in. Use those keywords in your website’s URL: One of the best ways to optimize your website is to incorporate keywords in your site URL. Search engines go through each line of text in your website to understand what it’s about. From your website URL to the content on your web pages, everything is analyzed and indexed by the search engines. Use keywords in Title tags, Meta descriptions, and Heading tags: Title tags are the name of a web page. When you open an internet browser, the text you see right on top of the dialog box is the Title tag. These are the links that show up in search engines. It’s the hyperlink that people click on. In order to increase the relevancy of your website (SEO-wise), incorporate your main keywords in the Title tags. If you want a perfect preview so the title doesn’t get cut off in the search results, keep these tags less than 65-70 characters. Also, avoid using stop words like a, the, and, if, then, an, to, etc. in the Title tags. Meta descriptions are the 2-3 line descriptions under the titles you see when you Google something. It is a short description of a business/brand which makes it easier for the potential customers to swiftly skim through all the search results. You are allowed a maximum of 155 characters to describe your web page, and it is recommended to use at least one keyword for that particular page. Heading tags are the HTML tags (H1, H2, H3, H4, H5, and H6) that are used to structure the content of website page. In addition to using keywords in your Title tags and Meta descriptions, also make sure to use your most important keywords in your Heading tags. These are probably the most meticulous details we will share with you in our digital marketing basics guide, but they are essential to effective on-page SEO. Include keywords in your website content and blog posts: As we said earlier, search engines use keywords to identify the relevance of a web page. Use your important keywords and their combinations in every piece of content you publish on your website. But beware of keyword stuffing because a) it looks spammy, and b) Google WILL find you and penalize your website. If you want to know more about optimizing your website, we suggest you read this simplified organic SEO guide to achieve page one rankings. Social media advertising means using social media platforms to promote and sell your products/services. If you want to master the digital marketing basics, starting with social media marketing is a great idea. One of the major advantages of advertising on social channels like Facebook, Twitter, Instagram, Pinterest, LinkedIn, etc. is that you can choose your target audience. According to Hubspot, 92% of business owners and marketers say that social media is crucial to their business. In fact, that same report says that more than half of people who’ve been using social media advertising for at least two years reported it helped them increase sales. So what social media platforms should you use for your business? Facebook: A Facebook Page for your brand makes you more discoverable, and is a great way to connect with potential customers. Facebook Ads have proven to be highly successful in gaining more exposure for a business. Instagram: Instagram is the best way to express your business visually. The platform offers several tools to help you engage with your audience. With 500 million monthly active users, Instagram is growing extremely fast. Twitter: Twitter for businesses reaches straight out to people who are looking for new products and special deals. According to a report from Twitter and Research Now, 93% of people who follow small and medium-sized businesses on Twitter plan to purchase from them, while 69% have already bought something from the companies they follow. Pinterest: With 100 million monthly active users, Pinterest is the most popular platform people go to discover new ideas. The visual content you create and share on your Pinboards can be used to catch the attention of your audience and encourage them to try your products. LinkedIn: LinkedIn is an essential network for building your brand and creating strong business connections online. You can use it to share content, keep up-to-date with trends, and connect with key influencers in your industry. Social media management allows you to manage all of your social profiles (Facebook, Instagram, Twitter, etc.) together on a single platform. Social media management also helps you handle your inbound and outbound online interactions in a better way. In simplest terms, it streamlines how you participate in conversations that are happening across different platforms – blogs, social networks (like Facebook), and even public and private online communities. Before you ask, yes, it still works. That’s why email marketing has become a lot more competitive now; it is one of the most effective channels in our guide to digital marketing basics. The key is to make your emails stand out, which is easier said than done. Before you create an email campaign, you need to understand the psychology of your potential customers. This comprehensive post will help you learn more about the importance of email marketing for your business. PPC is a form of advertising that is used to bring visitors to your website by using search ads for which you only pay for when someone clicks through. Why is PPC so popular with advertisers? Because it helps them attract quality traffic. By placing ads that only display when specific search phrases are used or on websites that have a specific kind of audience base, you can target well-matched audience to your business. This ensures that your website attracts visitors that are more likely to convert into buyers. If that’s not enough, consider this: you only pay for clicks and you can monitor the performance of your ads in real time. Benefits like these are why PPC advertising has proven to be highly successful for small businesses. When it comes to the digital marketing basics, one component that has been the talk of the town is content marketing. According to The Content Marketing Institute, it is a marketing approach focused on creating and sharing valuable and relevant content on a consistent basis to entice and retain a clearly-defined audience, and eventually, to drive customers to take a profitable action. This is the most accurate definition out there. Let’s simplify it a bit. Content marketing is a digital marketing strategy which focuses on creating strong relationships with your audience by giving them high-quality, relevant content. So when customers make a decision to buy something, they are already loyal to you. This content can be blog posts, articles, email newsletters, white papers, case studies, research papers/reports, infographics, videos, webinars, e-magazines, e-books, and much, much more. Why has content marketing become so important? Because brands are trying to answer the million dollar question: when customers go online to research a product/service before making the final buying decision (and 81% of them do), who’d they find – you or your competitors? The one thing you need to understand about digital marketing basics is this: being visible is everything. More and more people are going online to research and buy products and services, and if you want to catch their attention, you need to be found first. It’s all about creating highly valuable pieces of content for different parts of the purchasing cycle – from the research phase down to after-sales. The purpose of content marketing for a business is to educate potential customers, establish authority, and build loyalty. The point is to win their hearts with your highly-useful and helpful content. That way when they are finally ready to buy, they are more likely to choose you over your competition. Why do you think we’ve taken the time to write all these comprehensive articles! We think that the more you know about LYFE Marketing and our take on digital marketing basics, the more likely you are to choose us to help you with your business. Here are our best tips for creating a successful content marketing plan for your business. Well, that’s about it for the basics of digital marketing! Although this is an ever-growing field, you now have an adequate understanding of the main components of a digital marketing strategy. The number one challenge for most businesses is that it is multi-faceted; you need experts who are experienced and skilled in each area of digital marketing – SEO, PPC, social media marketing, email marketing, etc. Just a quick note, we have tried to give you the “big picture” here – this is not an exhaustive overview of everything related to digital marketing. But now that you know the basics, you are better equipped to take decisions regarding improving your digital reach. Feeling a bit overwhelmed? Speak with a professional to see how you can get started with digital marketing for your business.